Santa Cruz County is a wonderland for kids of all ages. 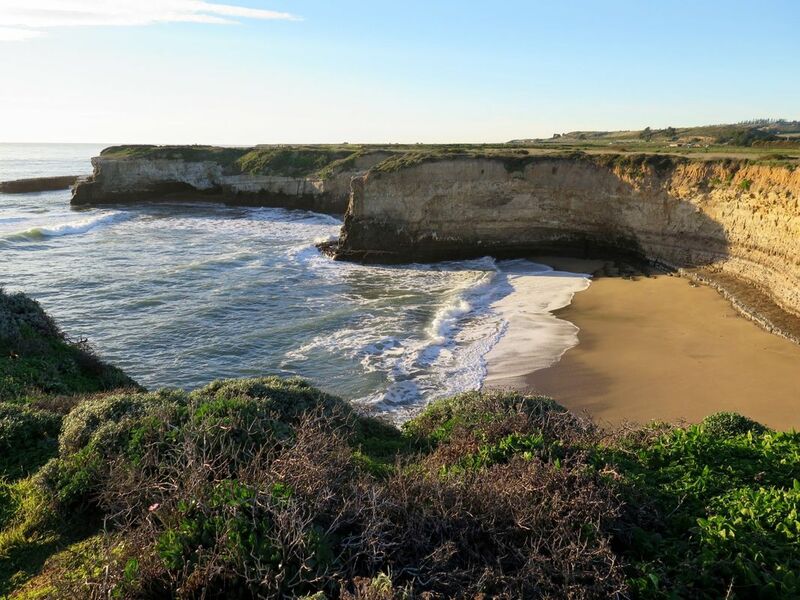 Santa Cruz beaches and forests, skate parks and zip-lines, hikes and story-times, museums and farms, and more means that there's always something fun for families to do in Santa Cruz County. 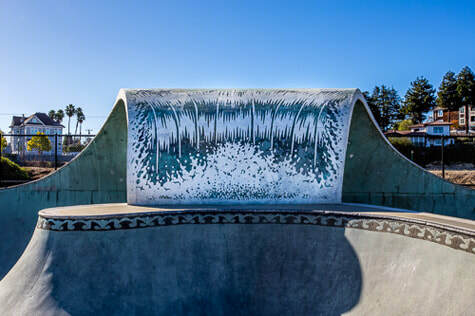 In addition to the kid-friendly activities in Santa Cruz listed below, you and your family might also enjoy Santa Cruz beaches, farmers markets, performing arts, annual events, attractions and summer camps. Join us at the libraries in Santa Cruz county for story times geared towards different ages and interest groups, including story times in Spanish. Groups read books, sing songs, make crafts, and play together. A tot play area, lawn, pinic table, and beach access can be found at this 1.5 acre neighborhood park. Restrooms are also available. This beach is known for its fishing pier and concrete freighter, The Palo Alto. The pier is open for fishing and you can walk out to look at the remains of the 1917 ship which used to be home to a dance hall, cafe, swimming pool, and carnival concessions. The ship is now home to countless birds and other sea life. The beach is also a popular swimming spot with a long stretch of sand backed by bluffs. There are covered picnic tables. 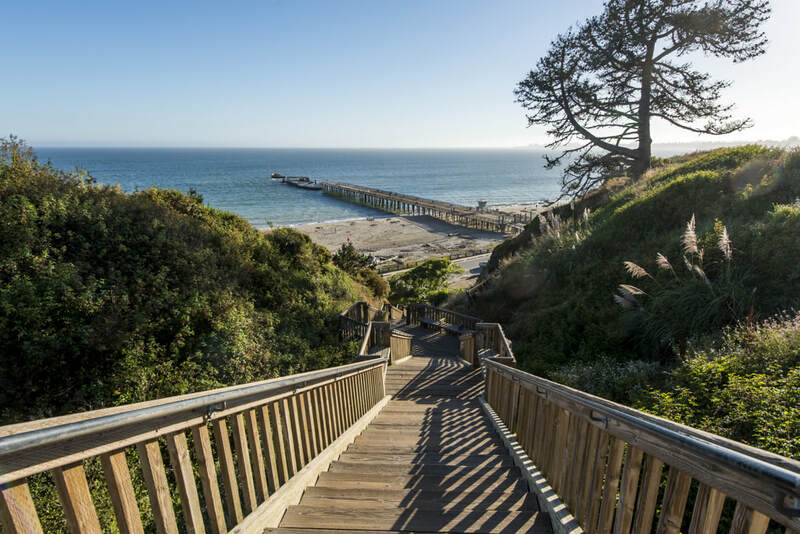 Seacliff State Beach has a park store and a small visitors center featuring exhibits that interpret the natural and cultural history of the area including Seacliff’s Cement Ship, marine fossil beds, and the Monterey Bay National Marine Sanctuary. The Santa Cruz Children’s Museum of Discovery is an interactive space where children can explore, question and investigate at their own pace. Leveraging children’s natural curiosity, the museum will complement more formal education in an environment full of laughter, enjoyment and sharing. Parents and caregivers can explore with their children as well as observe their children’s learning process. 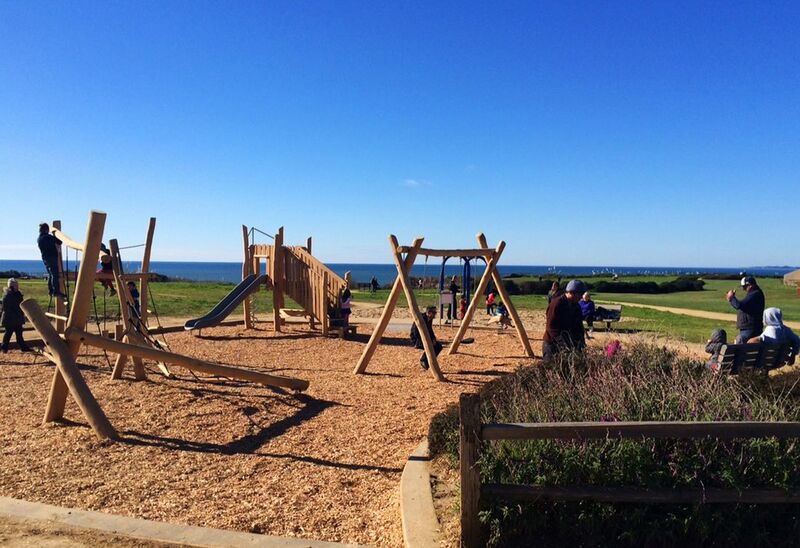 Stroll through this 6 acre neighborhood park or rest on one of the handsome benches created by artist Mary Fuller, which are carved with images of local wildlife, as you catch the breathtaking view of the Monterey Bay. A picnic area and a wheelchair accessible playground and restrooms are available. A path leads down to the beach. With over 30 miles of trails, hiking, jogging, and biking are some of the activities to be enjoyed here. Picnic tables and barbecue pits are available. The park offers rugged semi-wilderness, rising from sea level to steep coastal mountains of more than 2,600 feet. Once the site of logging operations until the 1920s, visitors can still find evidence of logging operations, mill sites and trestles in the park. A trail camp is located six miles from the nearest parking lot. Kids will love the trails and creek running through the park. Windfalls, by artist Alan Counihan, greets visitors to this 6.3 acre neighborhood park. Granite buckeye seed pods are grouped on the lawn area, with the autumnal theme echoed on the pavement and benches. Basketball and tennis courts, picnic areas with BBQs, and a playground are available. Restrooms are wheelchair accessible. This is a 26 acre park, complete with a playing field, group picnic areas, a playground, tennis court, volleyball court, and a beautiful house. Other amenities include 2 softball fields, 1 soccer field and 2 group (reservable) picnic areas. 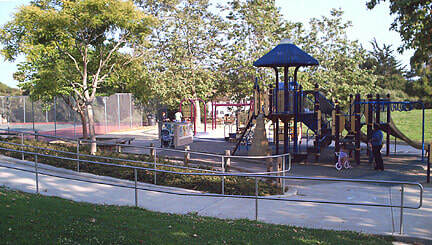 Also on the park property is a senior center and the children's center of San Lorenzo Valley. Public restrooms are open year round. Fishing is allowed with license. 8,500 square foot park with a separate skate area for beginners. Street and bowl style elements. Big Basin Redwoods State Park is California's oldest State Park, established in 1902. 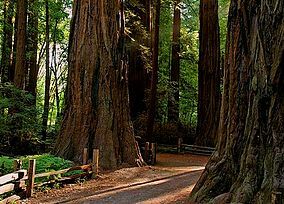 Home to the largest continuous stand of ancient coast redwoods south of San Francisco, the park consists of over 18,000 acres of old growth and recovering redwood forest, with mixed conifer, oaks, chaparral, and riparian habitats. Elevations in the park vary from sea level to over 2,000 feet. The climate ranges from foggy and damp near the ocean to sunny, warm ridge tops. The park features family and group camping, tent cabins, backpacking camps, hiking, mountain biking, and equestrian trails. The park has over 80 miles of trails. Be sure and pick up a map at park headquarters before your hike and take a look at the multimedia kiosk in the Sempervirens Room (next to park headquarters). The Skyline to the Sea Trail threads its way through the park along Waddell Creek to the beach and adjacent Theodore J. Hoover Natural Preserve, a freshwater marsh. The park has a surprising number of waterfalls and a wide variety of environments from lush canyon bottoms to sparse chaparral-covered slopes. A 3 acre park with a small horse arena that the public can use on a drop in basis. Other amenities include a basketball court, tennis court, a wheelchair accessible volleyball court, playground, horseshoe pit, and restrooms. 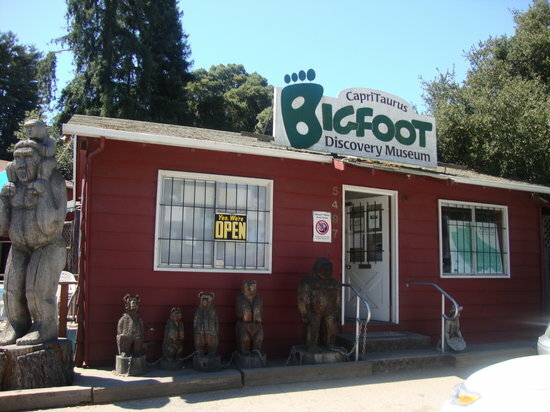 Exhibits of local history, tied in with local Bigfoot sightings, popular culture as it relates to the public view of Bigfoot, and actual evidence in the form of plaster foot and hand prints along with detailed exhibit on the Patterson-Gimlin Film. There are exhibits inside the main building as well as in the rear, a nocturnal diorama featuring Bigfoot and an audio-video outside cafe area where you can see Bigfoot documentaries of your choosing. Featured at this park is a covered wooden bridge, one of the few left in the state! Walk on the path, picnic or BBQ, play volleyball, use the playground or one of the large, grassy areas. Fishing with proper licenses is allowed. Restrooms are available. 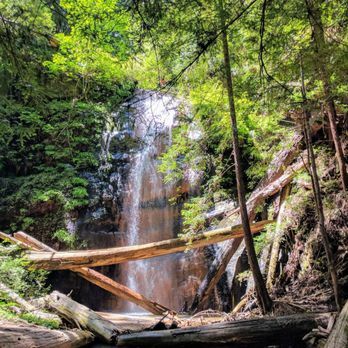 This park features 15 miles of hiking and riding trails through a variety of forested areas including redwoods, mixed evergreens, riparian, ponderosa pine, as well as rare ancient marine deposits called Santa Cruz sandhills. 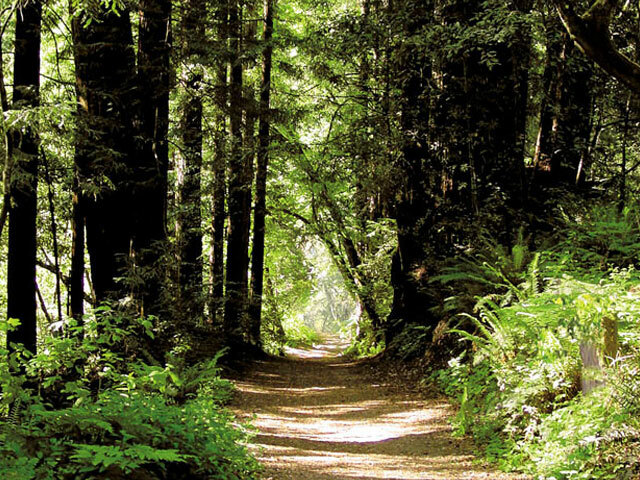 Henry Cowell Redwoods is home to a centuries old Redwood Grove that features a self-guided nature path. The park has a picnic area above the San Lorenzo River. Anglers fish for steel-head and salmon during the winter (catch and release). The park has a nature center and bookstore. The tallest tree in the park is about 285 feet tall, and about 16 feet wide. The oldest trees in the park are about 1400 to 1800 years old. 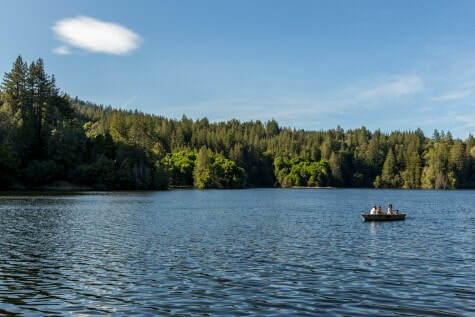 The Loch Lomond Recreation Area, includes a scenic 175 acre reservoir, provides the public with fishing, picnicking, boating and hiking opportunities annually from March 1 to mid October. Water Department Rangers coordinate the operation of a park store, a boat rental fleet and provide public service in the form of education, municipal code enforcement, and first aid. A staff of Ranger Assistants and seasonal Recreation Area Aides assist the Rangers in maintaining the Recreation Area, collecting fees, and operating the store. 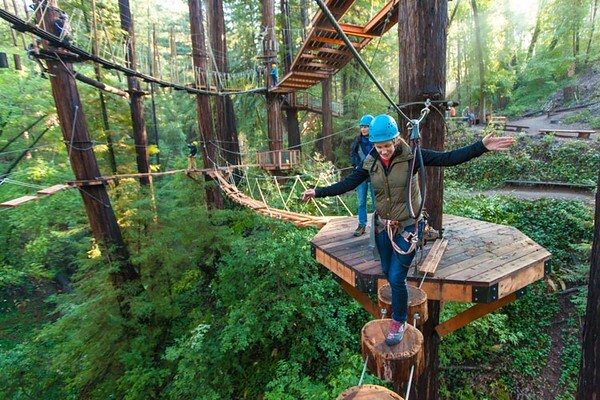 The Redwood Canopy Tours at Mount Hermon offers visitors an exciting eco-adventure into the redwood canopy of the Santa Cruz Mountains. Enjoy the coastal redwood forest from the unique perspective only a zip line canopy tour can offer. The two hour guided tour includes six zip lines and two sky bridges at heights of up to 150 feet. Each tour of up to eight people is led by two certified guides who share their ecological knowledge and bring the history of the Santa Cruz redwood forest to life. 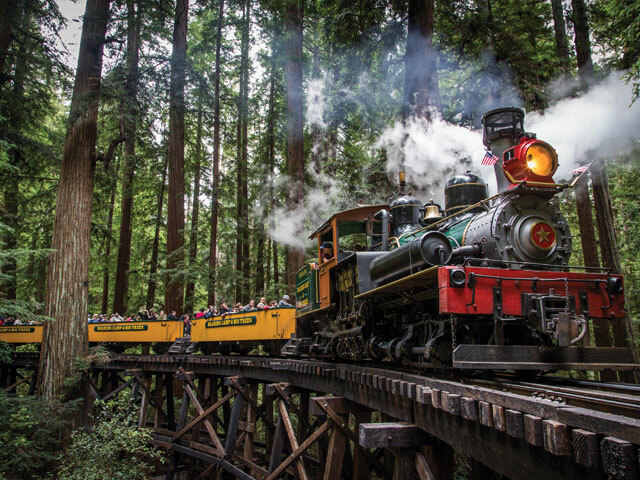 Roaring Camp Railroads takes visitors back in time on scenic train rides through the Redwoods of the Santa Cruz Mountains and to the Santa Cruz Beach Boardwalk at Monterey Bay. Roaring Camp is nestled in the Santa Cruz Mountains in the Town of Felton, California. Located just six miles up the hill from Santa Cruz lies a re-creation of an 1880's logging town, operating trains every day of the year except for Christmas Day. 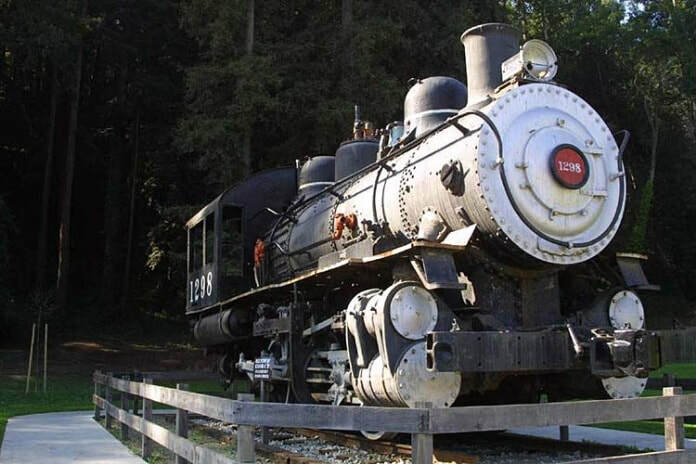 Roaring Camp is a heritage railway with authentic 1880’s steam locomotives operating on our Redwood Forest Steam Train excursion and 1920's era Beach Trains to Santa Cruz. 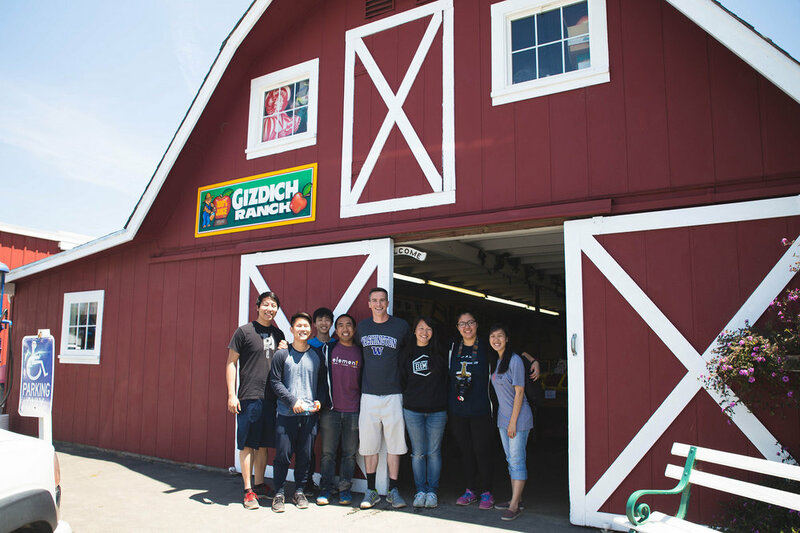 Activities in the town include: Train Rides, California Redwoods Hike, Chuckwagon BBQ, Red Caboose Restaurant, Gold Panning, Blacksmiths, Candle-Making, Visits with the Town Marshal, Old Time Photo Studio, Shopping at the General Store, Horseshoes, and Volleyball. There are also special seasonal train rides throughout the year. This is a 7 acre neighborhood park located on the corner of 30th and Brommer Street in Santa Cruz. 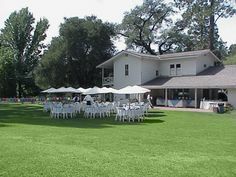 It has basketball, tennis, and softball courts, a playground, covered picnic area, and an abundant grassy area and bathrooms available year round. Tennis courts, picnic tables, a big grassy lawn, a wheelchair accessible basketball court, pirate ship playground, and restrooms are available at this 1.4 acre neighborhood park. A playful sculpture of an otter touching its tail, by artist Paula Zima, is especially popular with children. There is a tennis court and a half basketball court. 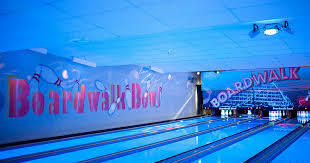 Next to the Santa Cruz Beach Boardwalk, the Boardwalk Bowl is a state-of-the-art bowling facility, arcade, restaurant, and lounge with plenty of party fun! Visit the full-service Pro-Shop staffed by IBPSIA Certified Professionals, where you can find everything from balls to bags, shoes and lessons. Grind Out Hunger Headquarters offers an Indoor Skate Park for the youth of Santa Cruz County as well as visitors to come and utilize. This skate park was designed by professional skaters for skaters. These ramps are used for skate clinics, lessons on how to skate, lessons on safety, private Grind Out Hunger benefit parties, and open skating. Harvey West Park is a 50-acre municipal park. 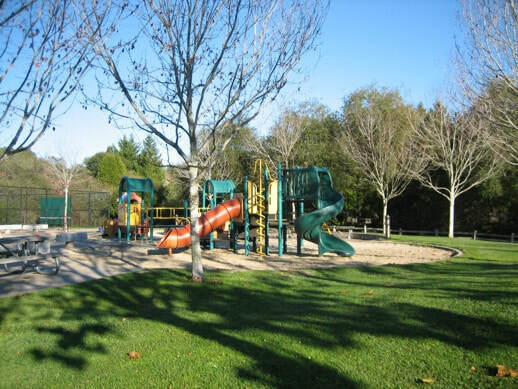 Located just off the intersection of Highways 1, 9, and 17, Harvey West Park is truly Santa Cruz' most complete park complex. The park includes hiking trails, swimming pools, ball fields, play equipment, clubhouses, barbecue pits, picnic areas and more. It's the perfect place for team sports, a Sunday picnic, or just a walk on the trails. Harvey West Park offers many features and services to the public. With six ball fields, the familiar crack of the bat and the finality of You're OUT! can be heard almost every evening. Plenty of barbecue pits and picnic areas make for lively family gatherings or relaxing, well-equipped picnics on any day. Kid's Kottage houses an excellent recreational preschool and summer day camp. The Clubhouse/Scouthouse is reservable for indoor activities. 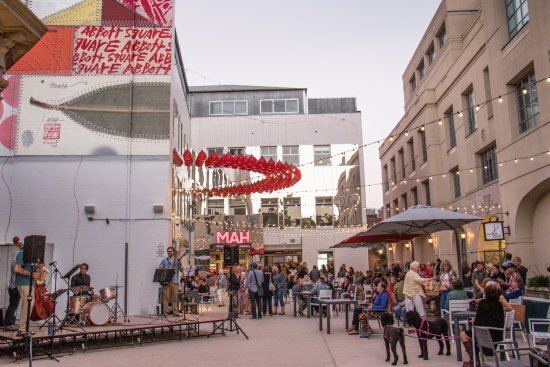 The Museum of Art & History at the McPherson Center (the MAH) is a thriving, central gathering place where local residents and visitors have the opportunity to experience art, history, ideas, and culture. 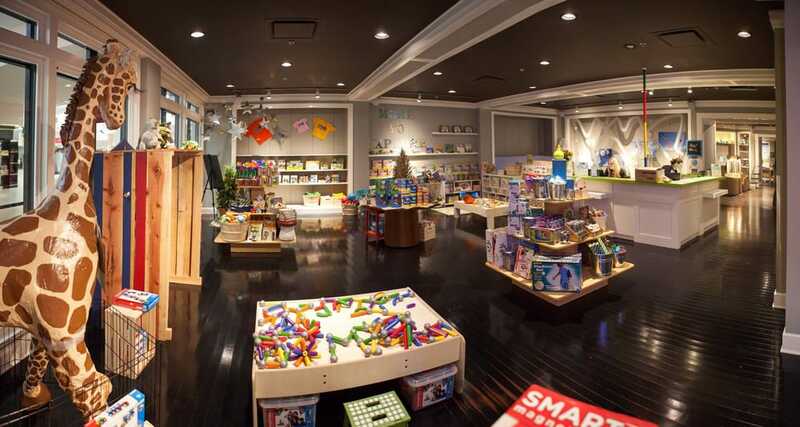 The Museum hosts events, an ever-changing selection of exhibitions, and many hands-on activities for kids. 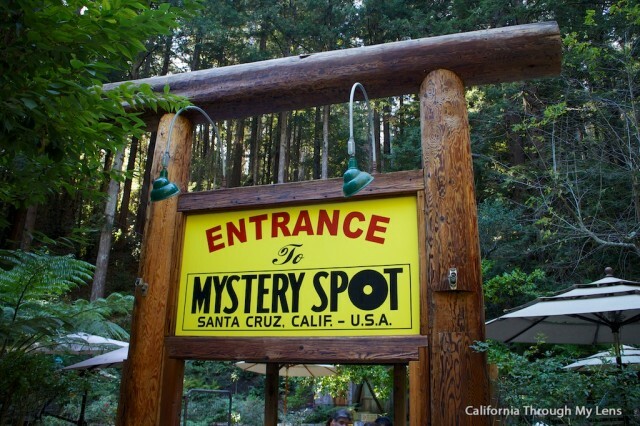 The Mystery Spot is a gravitational anomaly located in the redwood forests of Santa Cruz. It is a circular area of effect around 150 feet or 46 meters in diameter. Within the Mystery Spot you will be stunned as your perceptions of the laws of physics and gravity are questioned. Fun for all ages. 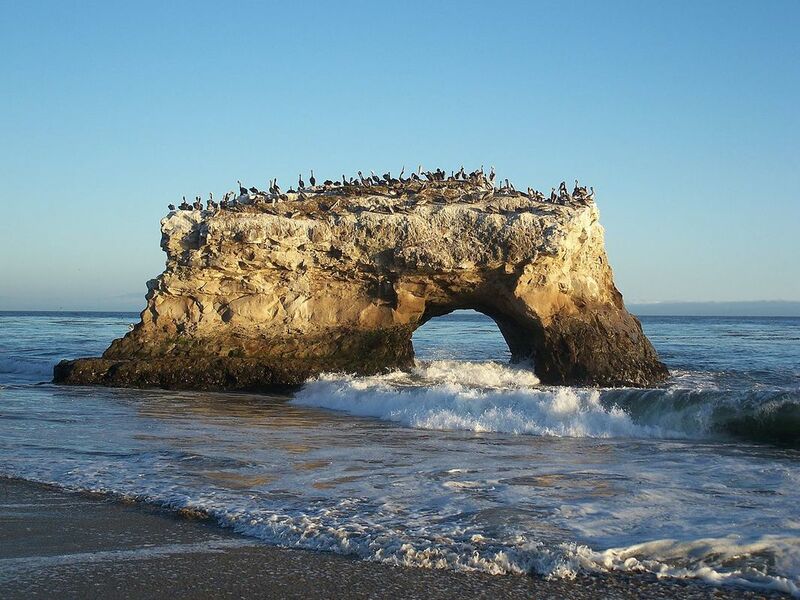 This beach, with its famous natural bridge, is an excellent vantage point for viewing shore birds, migrating whales, and seals and otters playing offshore. Further along the beach, tide-pools offer a glimpse of life beneath the sea. Low tides reveal sea stars, crabs, sea anemones, and other colorful ocean life. 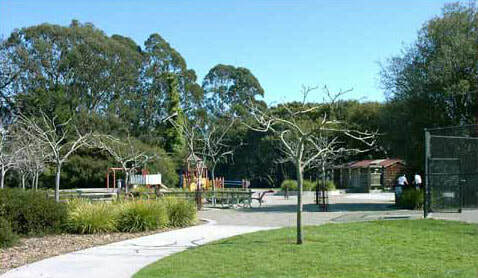 A picnic area is located off the main parking lot in a eucalyptus and pine trees grove. The visitor center highlights local natural history, and the bookstore has a selection of butterfly shirts, postcards and books for all ages. The park's Monarch Grove provides a temporary home for up to 100,000 Monarchs. From late fall into winter, the Monarchs form a city in the trees. 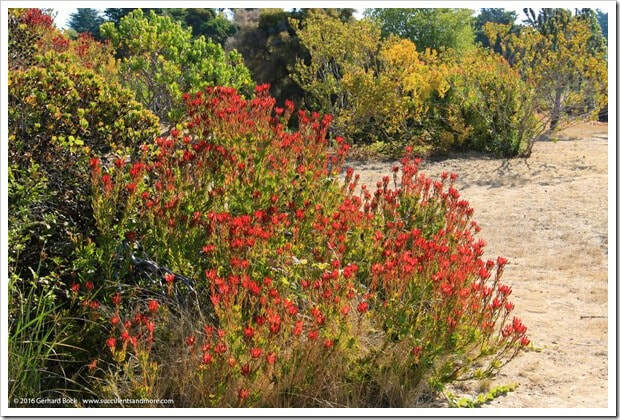 The area's mild seaside climate and eucalyptus grove provide a safe place for monarchs to roost until spring. Celebrate the butterflies' arrival with the Welcome Back Monarchs Day in October - and their departure with the Migration Festival in February. The Santa Cruz City Museum of Natural History, also known affectionately by locals as the whale museum, is one of the earliest museums in the state of California. Founded from the Laura Hecox collection in 1905, the museum's collections grew extensively throughout the years, acquiring many Native American and archaeological artifacts, as well as natural history specimens of the past. 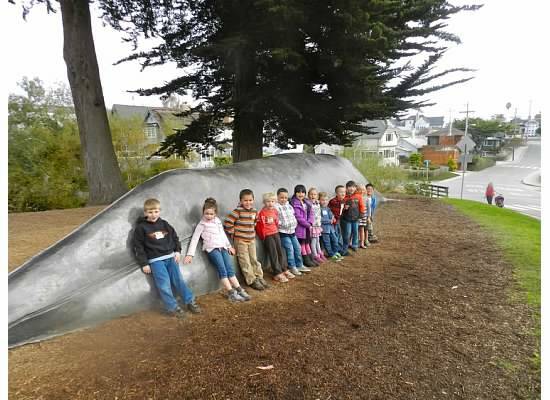 Located right across from Seabright Beach, kids will love climbing the huge whale sculpture outside. Check out this fast-paced adventure game of high-tech hide-and-seek! This isn’t Virtual Reality, IT IS REALITY! Players compete in teams or head-to-head in our 3,500 square foot arena. Each shot counts! The master computer calculates your score and ranking. Special lighting, sound effects, obstacles and fog add to the action. 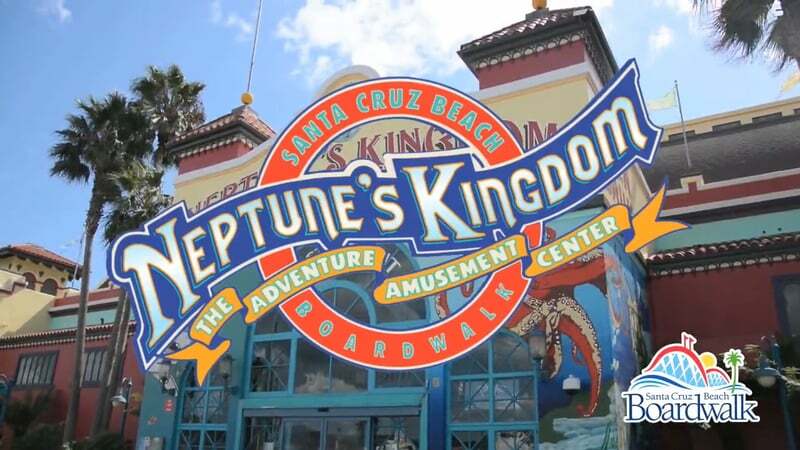 Neptune’s Kingdom is a nautical-themed entertainment center located on the Santa Cruz Beach Boardwalk. Watch out for pirates as you play through on the Buccaneer Bay two-story 18-hole miniature golf course, including 3 black light holes to test your skills! Test your skills inside Smuggler’s Arcade playing video games and pinball. Visit the Captain’s Game Deck upstairs for more fun and games including eight pool tables, air hockey, foosball, ping pong, snacks, and drinks. The Admission-Free Santa Cruz Beach Boardwalk! 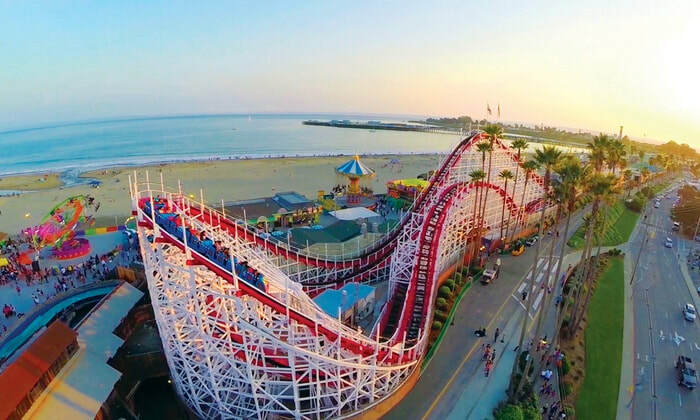 Enjoy the beach, rides, and free entertainment at the only major seaside amusement park on the West Coast. Enjoy roller coasters and rides for all ages, bowling, video game and pinball arcade, miniature golf, laser tag, free concerts, family fun, and more. 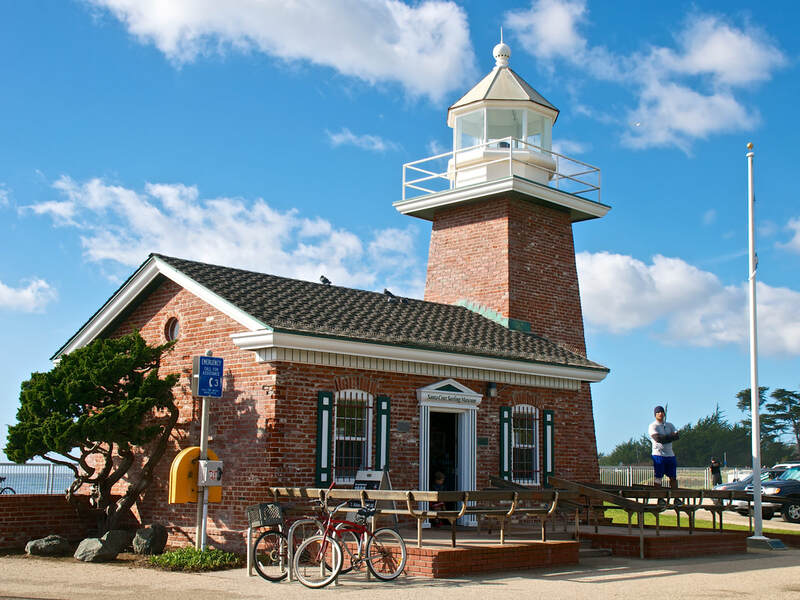 Located in the Mark Abbott Memorial Lighthouse at Lighthouse Point on West Cliff Drive, the Santa Cruz Surfing Museum is the first surfing museum in the world. The exhibits at the one-room Santa Cruz Surfing Museum explore this unique culture from its early origins in Hawaii through over 100 years of surfing in Santa Cruz. Overlooking the Steamer Lane surfing hotspot, this little museum features photographs, surfboards, and videos tracing over 100 years of surfing history in Santa Cruz. The museum contains the current Santa Cruz Light, marking Point Santa Cruz on the west side of Santa Cruz Harbor. After visiting the museum, take a quick stroll along the paved walkways on the cliffs and watch the surfers in Steamer Lane and the wharf and Boardwalk beyond. The Santa Cruz Mission State Historic Park sits atop Mission Hill offering a patio, gardens, and excellent views of the city. 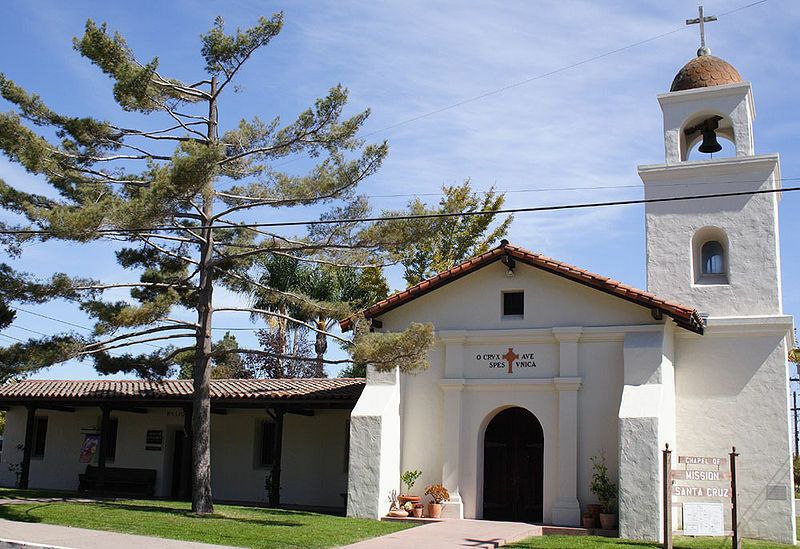 The park features the only building left of the 12th California Mission, Misión la Exaltacion de la Santa Cruz, founded by the Franciscans in 1791. 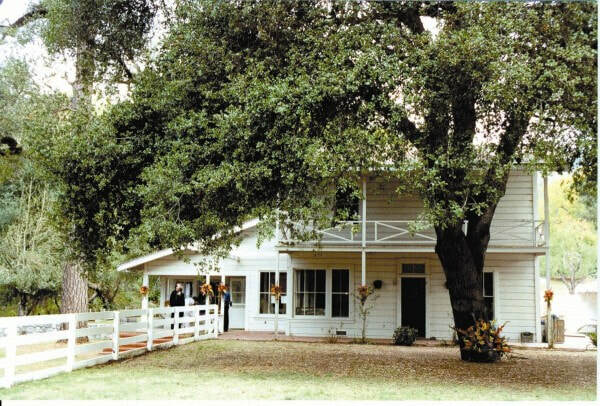 Restored to its original appearance, the austere single-story adobe was once housing for the California Indian residents of the Mission. Exhibits inside tell the story of the mission through the lens of the experience of the Ohlone and Yokut people. The Santa Cruz Wharf is the perfect setting for many exciting events and activities - a landmark destination for locals and visitors alike! Visit the Wharf's restaurants, shops, and be sure to check out the seals, otters, and sea lions swimming around the wharf and sleeping on the piers. 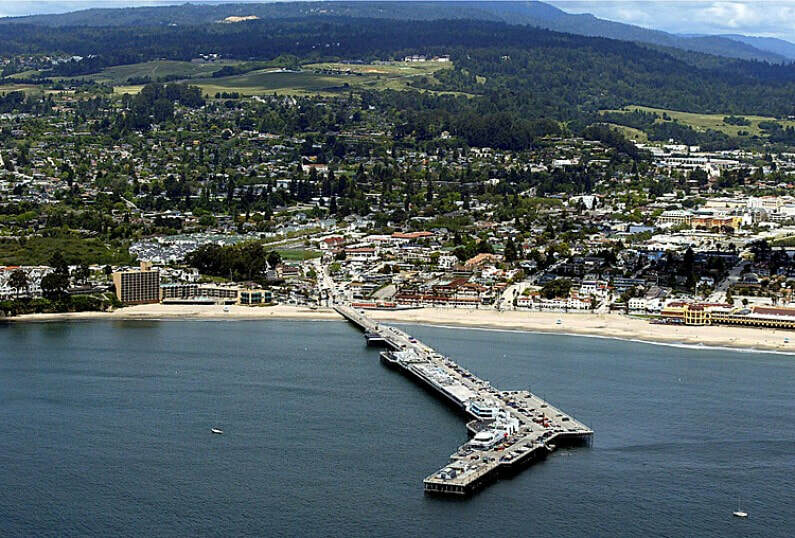 The Santa Cruz Wharf offers seaside shopping, dining, and recreation. You'll find everything from handmade arts & crafts to beach apparel, outdoor fresh fish markets to fine dining, whale watching, fishing trips, and kayaking. Santa Cruz Roller Palladium Roller/Inline Skating Rink was founded in 1951, Santa Cruz Roller Palladium is an indoor rink and open year round. 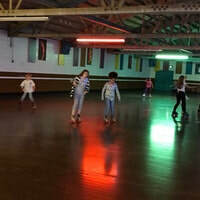 Hearkening back to the '50s, this all-ages roller rink has special events and tons of fun for both the casual skater and the pro. Offering classes as well as Jazzercise and other events, the Palladium is one of Santa Cruz's oldest fun-zones. Roller skating sessions for the public with fun music, games, and skaters of all ages and skill levels are one of the main attractions at Santa Cruz Roller Palladium. Skating provides great exercise and an opportunity to get out of the house - plus, it's not like exercising at the gym... skating is fun! Lace-em up and come join the others. Get on the floor and get ready for a great experience. 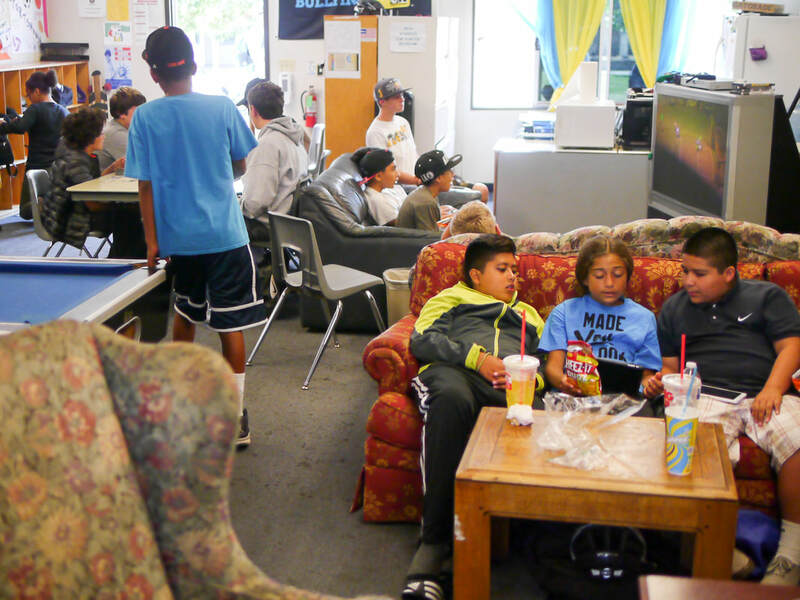 Stop in at the Santa Cruz Teen Center for recreational activities such as basketball, pool tables, Wii, X-Box 360, outdoor activities, foosball, movies, internet, music and a pretty chill space. Also pick up our current calendar to find out what’s happening for teens in Santa Cruz. The Teen Center sponsors dances, band nights, special events, day and overnight trips, sports, and outdoor events in addition to daily activities. The trolley is the best way to get back and forth between the beach and downtown and avoid parking and traffic. The Santa Cruz Trolley is convenient, ADA-accessible, and an enjoyable way to experience what Santa Cruz has to offer for all ages. Trolley riders can park downtown and easily get to the Monterey Bay Exploration Center, the Wharf, Main Beach, and the Boardwalk and still have time to shop and dine in the Downtown. The trolley leaves the historic Del Mar Theatre at 1124 Pacific Avenue every 30 minutes on the hour (:00) and half hour (:30) to bring you to the beach. 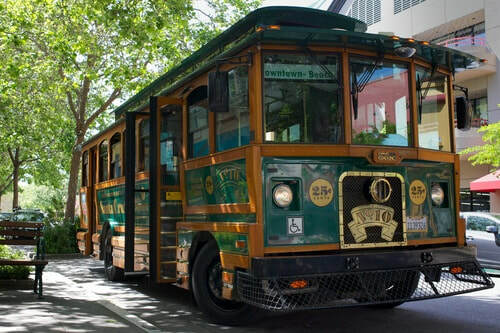 The trolley leaves the entrance to the Santa Cruz Wharf at 106 Beach St at quarter after (:15) and quarter of (:45) each hour to bring you back Downtown. And it's just 25 cents! Visit a working marine laboratory. Exhibit halls, aquarium, touch tanks, tours to marine mammal research overlook, Ocean Discovery Shop, and unsurpassed vistas of the Monterey Bay National Marine Sanctuary. Hold a sea star — marvel at the world's largest whale skeleton — touch a shark— think like a scientist! There are four pools, a slide, and community center with kitchen. 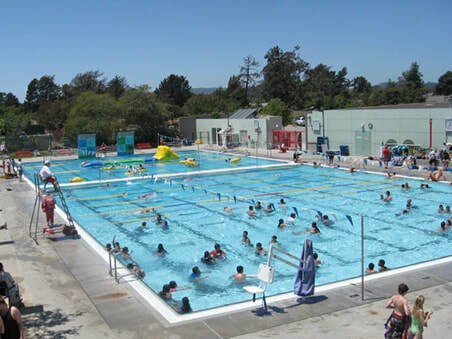 The 50-meter, 18-lane lap pool is the largest in Santa Cruz County. This pool is used for lap swimming, water polo and water aerobics. The water temperature is 78 degrees. The 43k gallon warm water pool is used for therapy and recreational swimming, the temperature is kept at 88 degrees. There is a zero depth entry ramp for easy wheel chair access. The Splash-Down pool is used to catch kids (and adults) at the bottom of the two story cork screw slide. The fourth pool is the Splash Pool, with its splash features and six inch depth it is perfect for tots. Take a walk through this extensive collection of Australian and New Zealand plants outside of their native countries, the most diverse collection of eucalyptus and their relatives to be found in one easy-to-access area, an unmatched collection of conifers and other trees, and extensive representatives of South African Proteas, and native California flora, the Arboretum is home to a world-class living collection. There are picnic tables and benches located throughout the gardens. Skypark features large fields for soccer events, playground structures for older and younger kids, bocce ball courts, basketball half-court, tennis court, BBQs, picnic tables, fitness trail, dog park, and skate park. Pick your favorite fruit of the season right off the tree or vine: Strawberries, Olallieberries, Boysenberries, and Apples. Experience the most fun part of growing fruits—it's a whole lot of fun for the kids and the entire family. After picking, take a self guided tour of the apple orchard and berry farms. If you're here on Saturdays (September-May only), you can watch the apples get pressed for juice. When everyone's ready for lunch, picnic behind the barn among the apple trees and the hills and let the kids play.